Keeping in with our theme of spills, crashes, injuries and utter turmoil, it has always struck me as to what people do with their destroyed carbon fiber bikes after a crash. Do they trash it in the dumpster? Do they try their best and send it somewhere for a repair? Do they salvage some parts and try to use them in a different application and setting? What would you do? 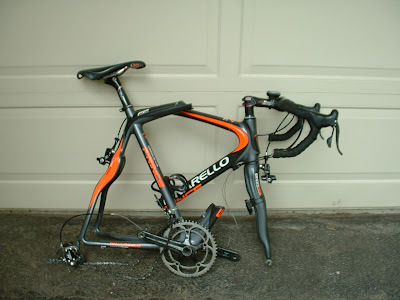 This blog has shown you a number of instances in the past where bikes and bicycle components have failed. Now often there is a legitimate reason for these occurrences which I don't want to go into. But what happens afterward? What do you do with this pile of seemingly junk metal and carbon fiber? If something like this happened to a professional bike rider, he would of course get replaced immediately with a new one. The rest of us in the world may not always have this luxury. But as bike riders, we don't want to sit without a bike for long. Eventually, the money will come and we all will get a new bike, somehow. What happens to the old one? If it is indeed decided that it should be disposed of, is there any possibility for carbon fiber to be recycled? This is an interesting subject because it turns out it isn't so easy to do this. I have captured two different thought processes when it comes to carbon fiber as a "clean" and recyclable material for the environment. I think they will interest you because most of us call ourselves 'clean' to the environment and fans of sustainable sports and transportation. But is that really true? Now here's an opposite viewpoint, shedding a more positive light on carbon fiber's prospects for recycling. B. Thermal Decomposition Possibilities : "When it is time to decommission CFRPs they cannot be melted down in air like many metals. When free of vinyl (PVC or polyvinyl chloride) and other halogenated polymers, CFRPs can be thermally decomposed via thermal depolymerization in an oxygen free environment. This can be accomplished in a refinery in a one-step process. Capture and reuse of the carbon and monomers is then possible. CFRPs can also be milled or shredded at low temperature to reclaim the carbon fiber, however this process shortens the fibers dramatically. Just as with downcycled paper, the shortened fibers cause the recycled material to be weaker than the original material. There are still many industrial applications that do not need the strength of full-length carbon fiber reinforcement. For example, chopped reclaimed carbon fiber can be used in consumer electronics, such as laptops. It provides excellent reinforcement of the polymers used even if it lacks the strength-to-weight ratio of an aerospace component." - Wikipedia entry on CFRP's. In light of these two statements, do you think there's a distinct possibility that carbon fiber from our trashed bicycles could be recycled and reused, or is the technology still catching up with us? Is the bicycle industry studying solutions to make this happen, or do they really want to take opportunity of this 'repair and reuse' handicap? That would mean more sales for them in terms of new bikes and equipment, so why should they bother, eh? In one of their catalogs from the late 80's or early 90's Bridgestone had short essays about the environmental impact of metal frame materials - steel, aluminum, and titanium. It would be interesting to see how composites "compete" cradle to grave. The sport of cycling, atleast on an international level, is hardly "sustainable". Just look at the Giro d'Italia or the Tour de France. Multitudes of vehicles on the road, helicopters in the air, plus look at the amount of food these competitors consume? What's the impact to the environment from all this??? Someone should really delve into this topic. Interesting bit about thermal decomposition. Can one do this themselves? Maybe not? The toxic fumes might not be healthy. There is no recycling. The resin is cross linked polymer. It can be ground into land fill or incinerated. There is no chemical pathway to something useful; only to atoms and a devils brew of toxic fumes. The only use of wrecked "carbon" bicycle frames is to keep them for the edification of future generations, who will never believe that such c*** could ever be marketted in the first place. I have taken due note of the fact that you don't want to go into the details of why "CF" is unsuited to bicycle, let alone aeroplane manufacture, so won't comment on that.